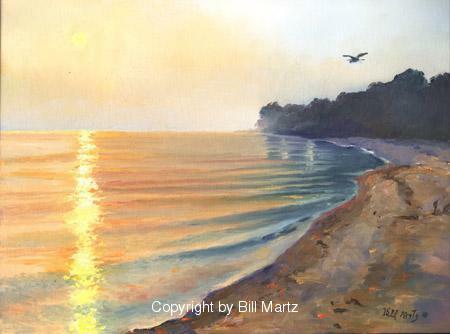 I was in the mood for a new desktop background and Googled Chesapeake Bay a few months ago when I stumbled across Bill Martz. 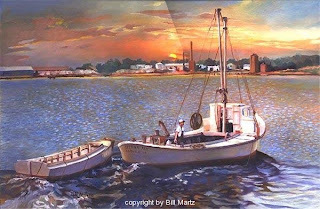 Bill Martz is a painter whose work focuses on the Northern Neck area of Virginia. His works are about life on the water and feature the Chesapeake Bay and its tributaries, landsapes, boats, wildlife, and people. I selected this for my background. As I've mentioned before, I have grown up boating and on the water. When on the water, a peace and at home feeling comes over me that is indescribable. 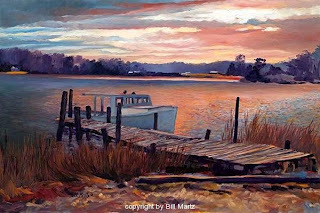 Here in Virginia, we say we are going to the "Rivah" and Martz's works transport me there. Below are some of my favorites I found on his website. Painting inspired by George Washington's birthplace. I hope to someday be able to own a Martz painting. Do you like his style? What are some of your favorite artists? 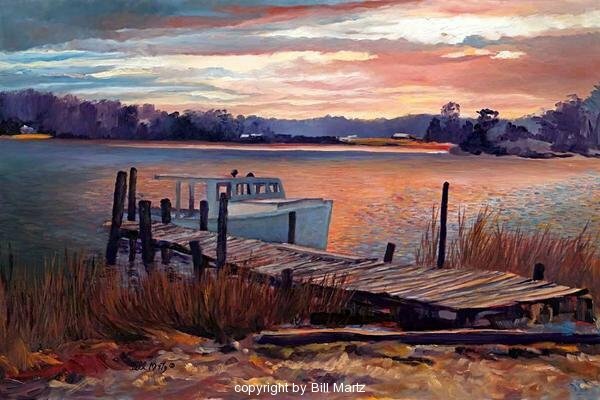 I once went boating in the water between VA and MD when I was up there - gorgeous. I, too, love the water but grew up going to the white sandy beaches of Florida. I've never heard of Martz before, but I really like his work! The landscapes are quite idyllic. I graduated with a degree in the History of Art & Architecture, so I love paintings, esp. 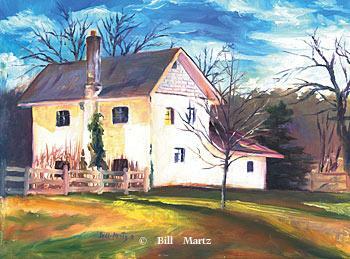 those done 'en plein air'. Hi! Thanks so much for stoppig by..so glad you did so that I could discover your blog too...love it, we like many of the same things! Beautiful art.....love the old barn painting and anything of water always gets my attention, beautiful colors. Thanks for sharing..am your newest follower!! Wow ! Those are some fantastic paintings. I really loved them all. The style is nice. I do not know much about painting styles or painting artistes to be honest. But my best friend has been the best painter I know so far. He has given me 2 paintings specially made for me during our childhood which I still cherish and will cherish forever. Hope to see you stop by my blogs. Gorgeous, love the farmhouse print especially! Gorgeous Gorgeous Gorgeous Paintings! They're fabulous, detailed and the skies in his paintings are lovely! Oh my gosh, these are just beautiful! I love the one of the beach...it's simply stunning. Thanks for sharing with us! Hello new follower! I am now a new follower of yours too and I am very pleased you stumbled across me! 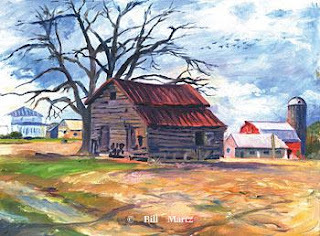 These paintings are beautiful - I am just reading a book that is partly set in Virginia and these pictures are exactly how I was visualising the landscape. Stunning. Wow these are beautiful! 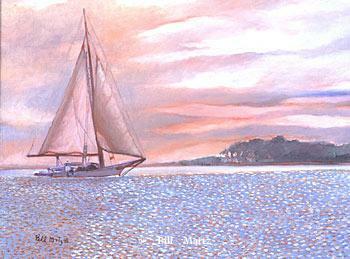 I'm a Renoir fan myself, he uses similar colors as these. These are very beautiful! I love discovering new artists I had never seen before! Thanks for stopping by my blog! These are so pretty! I love last one--gorgeous!